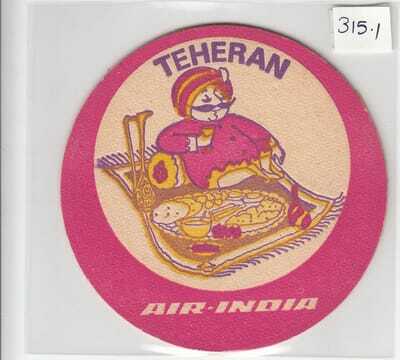 ​The Air-India Maharajah is present in every Air-India coaster design. 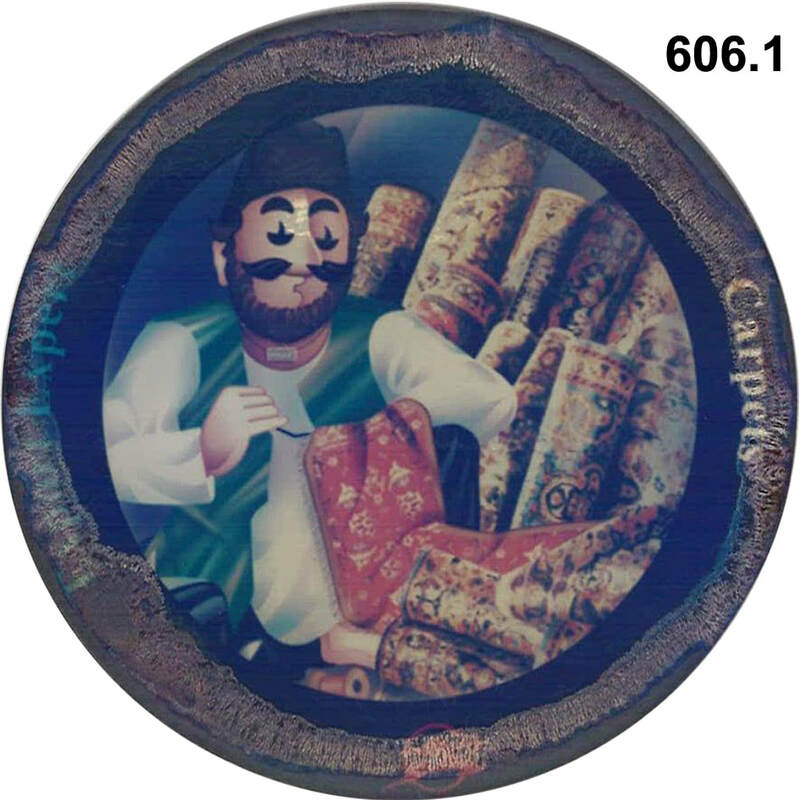 In many designs, he is in his royal costume, and in others he is dressed in the traditional attire of the destination mentioned in the coaster. Sometimes alone, many of the times he is with a native woman in her traditional attire. Other times he is with a man, and sometimes with an animal. Always smiling, always cheerful! Humour and panache were essential ingredient of the Maharajah’s persona, and we should take his antics in some of the cartoons with a little forbearance, and a lot of fun. Certainly cheeky, a characteristic easy to offend anyone who wants to take offence, the Maharajah was simply the most lovable and charismatic brand icon ever created by any commercial enterprise, anywhere in the world. His chutzpah often got the Airlines' founder, J. R. D. Tata into hot water and he had to assuage hurt feelings of various communities, including once in Parliament. ​The Maharajah simply being himself – I could never understand why this got some people got upset. 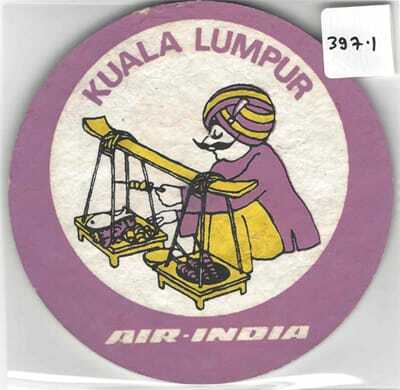 ​The coasters were mostly used for in-flight service (Type 1.1 & 1.2, Type 2, Type 3 and Type 4.1) or later as on-board gift items to passengers (Type 4.2) . Type 5 was perhaps used for both purposes. Only preliminary external research has been done to ascertain dates, quantities, designs produced etc., and this makes for an interesting subject of deeper study at a later date. I have attempted to classify these coasters basis various some easily visible aspects like design, airline name, destination etc. The destination has proven to be an important clue in sequencing and dating the series and individual coasters, as dates of start (and often times cessation) of service to a particular destination are reasonably well documented. As an Aerophilatelist, I have also completed a reasonable study of Air-India first flights and Time Tables, which has helped me put the chronology together. 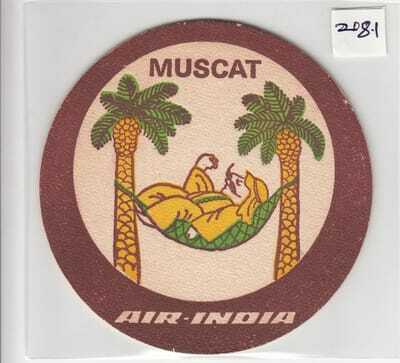 I have attempted to classify and list out all possible varieties of Air-India coasters in an organized manner. There is a bewildering variety of these coasters, with differences in destination, airline name, layout, image, text, colour schemes, surfaces printed, material used and thickness. Added to these are some unusual designs, printing errors and shade variations. Anyone interested in collecting these coasters can start in a simple way with destinations, and go deeper over time. The designs used over the series vary, and have been broadly classified by me into 6 types, in chronological sequence, and will help identify the period during which these coasters were perhaps printed. I have numbered them from Type 1 through Type 6. Additionally, Type 1 and Type 4 have two sub-classifications each, 1.1 & 1.2, and 4.1 & 4.2, thereby actually creating 8 categories in all. So, let's start our journey by getting familiar with the different Types, and then diving deeper into each Type. Greetings! or simply, my salaams. 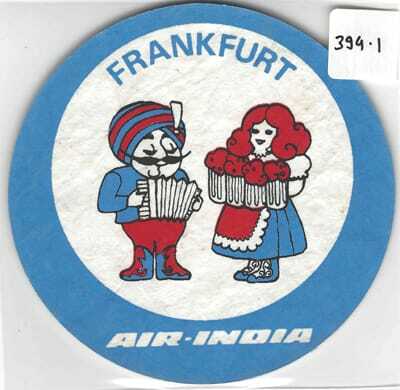 Type 1.1: There are two characters, the Maharajah in his royal costume, and he is greeting the other character according to local custom – The Airline name is Air-India International – Concentric Circles. These were possibly issued between the early 1950s and the early 1960s. 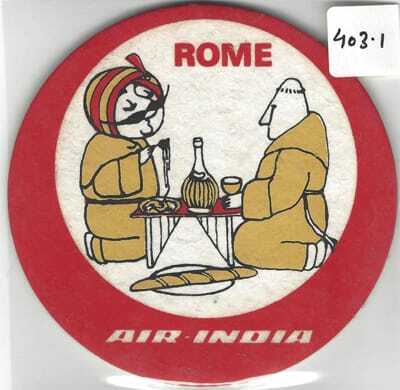 Type 1.2: There are two characters, the Maharajah in his royal costume, and he is greeting the other character according to local custom – ​The Airline name is changed to Air-India – Concentric Circles. 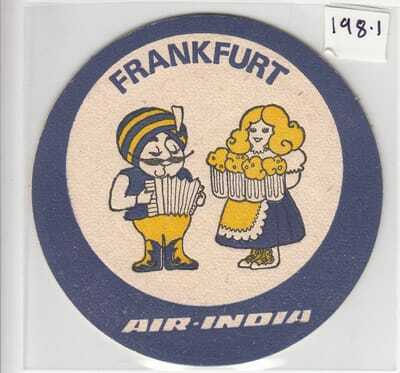 These were possibly first issued the early 1960s, just after the airline changed its name. New destinations stopped getting added after 1964, but the airline continued printing coasters for the ones already being serviced all the way until the mid-1970s. Type 2: Unusual designs. Only two coaster designs, Tehran and Brussels, do not connect with prior or subsequent designs. These were possibly issued between 1967 and the early 1970s. Type 3: The Maharajah is in local costume, but no other character – Concentric Circles. These were possibly issued between 1967 all the way until the early 1970s for new destinations added during this period. Live the good life. Food & Drink is what I do. Type 4.1: The Maharajah in local costume and partaking in local activity – Eccentric Circles. In all these, he is somehow connected to food or drink. Either eating, or serving others, or selling, or cooking. These were possibly issued from the early 1970s until the mid-1980s. Many new destinations added by the airline found themselves a place on these coasters for the first time. R. K. Laxman at his best. Our Type 5: New R. K. Laxman series - Maharajah, sometimes in his royal robes, and other times in a local costume and partaking in local activity – Square paper pulp coaster in gift pack. These were perhaps used from the mid-1980s until the practice stopped sometime in the 1990s. Again, new destinations appear for the first time, and existing ones get a fresh touch of humor form the brush of Laxman, India's best known cartoonist. This is a new set of six coasters with in a gift box. They are printed on one side only, and have the Maharajah in classical and folk dance attire of specific states in India. There is one coaster with the Maharajah on an elephant. This set has perhaps been issued in 2016 only. 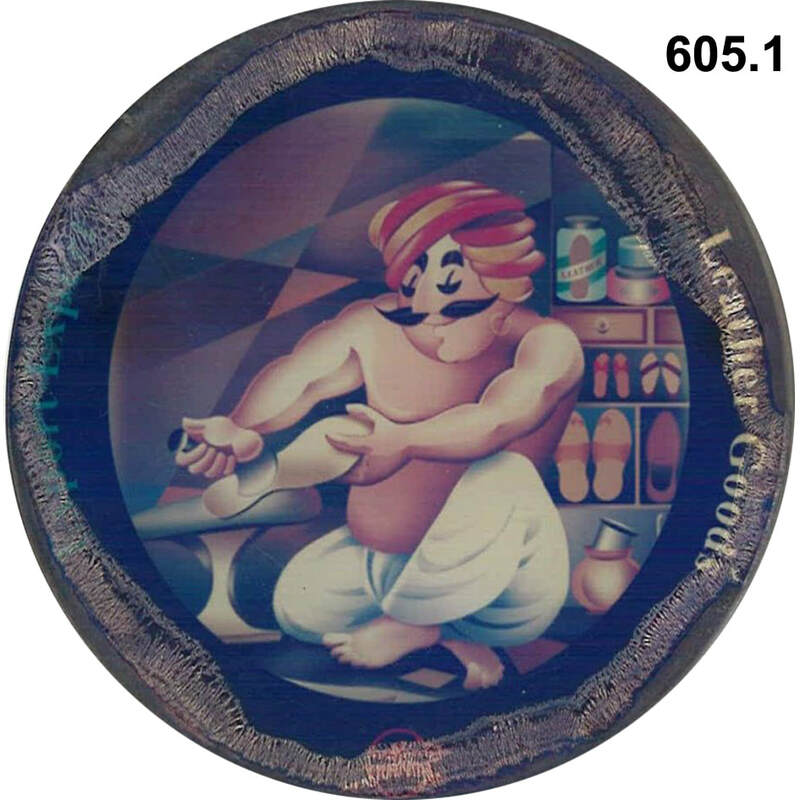 Issued at the same time as the set of 6 folk dance design coasters, this set of 6 has the globe-trotting Maharajah dressed in local attire visiting his favorite cities across the world. He has exchanged his royal robes for local attire, and is shown near the famous sites of the cities he visits. These round shaped coasters are made of paper pulp and have an outer diameter of 108 mm. They have a solid coloured border about 8 mm thick, and there is no background colour inside the inner circle which is about 92 mm in diameter. Printed inside the circle is the name of a destination, usually a city, but in some cases, the name of a country. 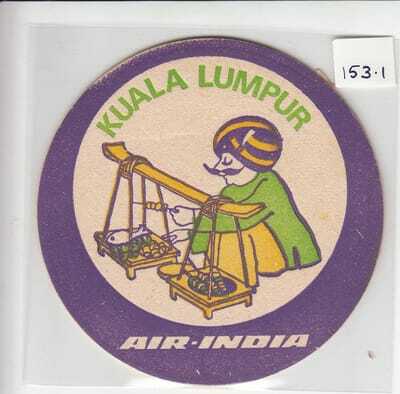 The airline name printed in the bottom arc of the inner circle is Air-India International (Type 1.1), or Air-India (Type 1.2). Cartoon: Inside this inner circle is a drawing of the Maharajah in his royal dress (sherwani – generally in red) greeting a person, dressed in traditional attire, in the local custom of the destination mentioned. Type 1.1. The airline started operations started on 8 June 1948 with the first flight from Bombay to London via Cairo and Geneva as Air-India International, until it changed it’s name to Air-India in April1962. 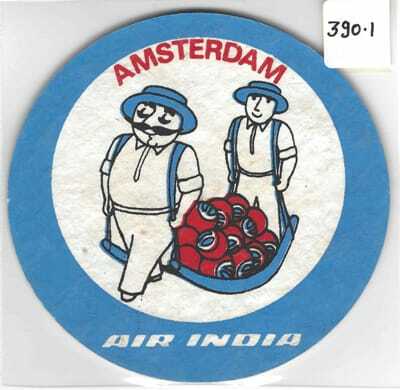 Type 1.1 coasters would have the airline name as Air-India International. It would be fair to date Type 1a. coasters from after 1948 (possible starting early 1950s), and until 1962. Type 1.2. The same type 1.1 cartoon continued for routes that continued to be in service after 1962, and new cartoons were created for routes added just before, and certainly after April 1962. These would have been continued to be used until the 1970s. Type 1.1 - Release 1. Air-India International started operations on 8 June 1948 with it's Bombay - London service with stop overs at Cairo and Geneva using Lockheed L-749 aircraft. The airline went on to purchase 6 of these aircraft between 1948 and 1949. It also bought 2 Douglas DC-4 aircraft, and then the Lockheed Constellation L-1049 aircraft. These were the pride of the nation, and provided comfortable and efficient service until they were replaced by Boeing 707s in the early 1960s. The story of our coasters starts with the Lockheed era in the airline. My study reveals that Type 1.1 Coasters were first released with a silver border, and had a Silver + Red colour combination. Black was the other colour used. These have been found with Cairo, London and Rome as destinations. 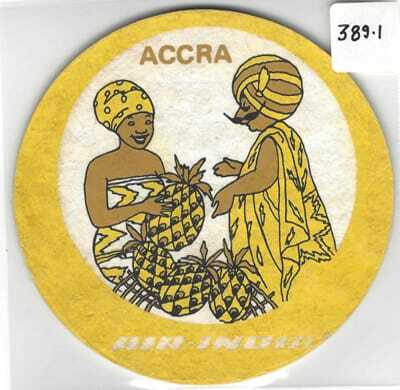 These are rare Coasters, and I am sure we will come across examples for Geneva, Nairobi, Paris etc. in time to come. Type 1.1 - Release 1. Silver Border used for early destinations. Type 1.1 - Release 2. Brighter colours. These were issued a little later in the Type 1.1 series, and by replacing silver with brighter colours, a much more vibrant and colourful effect is created. Here are images of Type 1.1 - Release 2 coasters. Generally, the colour scheme was followed consistently once the coaster was designed. However, examples of change in colour scheme within Type 1.1 are shown below. The silver colour used earlier is on the left, and brighter colours brought in later are on the right. We have above 3 examples of Type 1.1 coasters issued in Silver + Red (release 1) and then within the same Type 1.1 later issued in another colour combination (release 2). Bangkok is an example of two colour variations within Type 1.1 which is not the Silver that we saw replaced above. it is easy to notice that the Yellow + Red combination continued into the Type 1.2 series, and hence the Green + Red issue pre-dates the Yellow + Red issue. Here is another example of two colour combinations in Type 1.1. The Red + Yellow for Paris is not easily seen, and later replaced with Green + Red, which continued in the Type 1.2 series as well. Notice the Printers name and address visible on the Red + Yellow example. 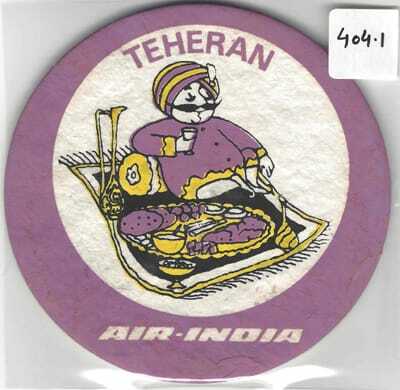 This is the only Air-India coaster I have seen with this information printed on it. Here we have the Type 1.1 India coaster. The airline used Bombay as it's base, and most flights did originate or pass through Bombay. 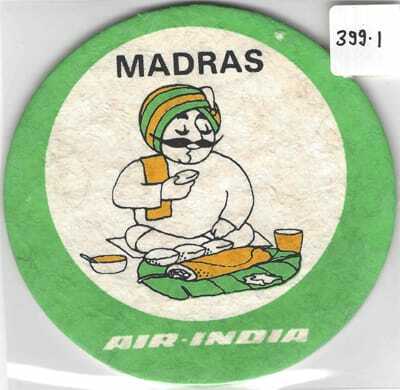 However the airline ensured that Calcutta, Delhi and Madras were also served either on the international routes, or by convenient connecting flights. 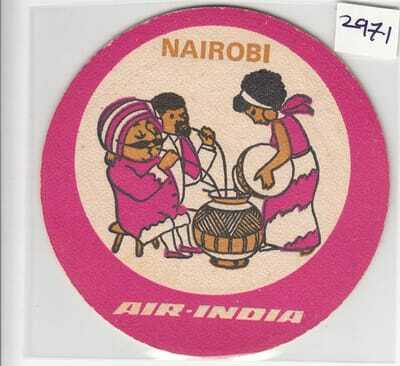 The airline did not issue coasters in the name of any other major country, always in the name of the city serviced. 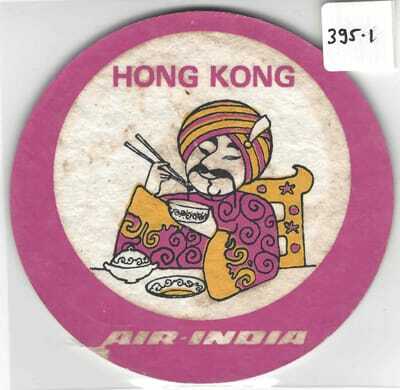 However, for some unfathomable reason, the airline never issued coasters for Bombay, or other domestic destinations until it launched the Type 4 series, which we estimate happened in the early 1970s, a good 25 years after the airline was launched. It appears that for our Maharajah, all of India was his domain! The Airline changed its name from Air-India International to Air-India in April 1962. 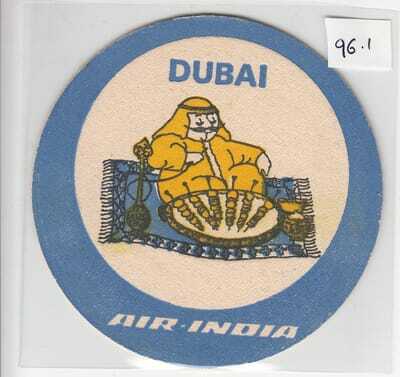 Naturally, this called for a major re-branding and the Type 1.1 coasters were also henceforth printed Air-India for destinations that continued to be serviced. The Airline by then had purchased seven Boeing 707 aircraft, was undergoing major expansion and modernisation, and went on to purchase four more, followed by the larger Boeing 747 Jumbo Jets. There was no change in the design and layout. 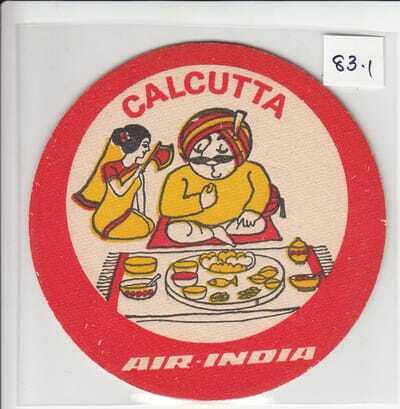 the only thing that changed was the name of the airline was changed on the coasters to Air-India. The variety was larger as new destinations got added. In Type 1.2, the colour scheme did not change all that much. There are a few examples like Rome and Nairobi. Since these changes occur on very few examples, I am inclined to classify them as errors, but since technically, they belong here as a shade variation, I am listing them here, and providing the images below. Nairobi: Brown + Red changed to Pink + Red. Rome: Light Blue + Yellow changed to Deep Purple + Yellow, changed to Brown + Yellow. Unusual Designs – not confirming to any other Design Type. 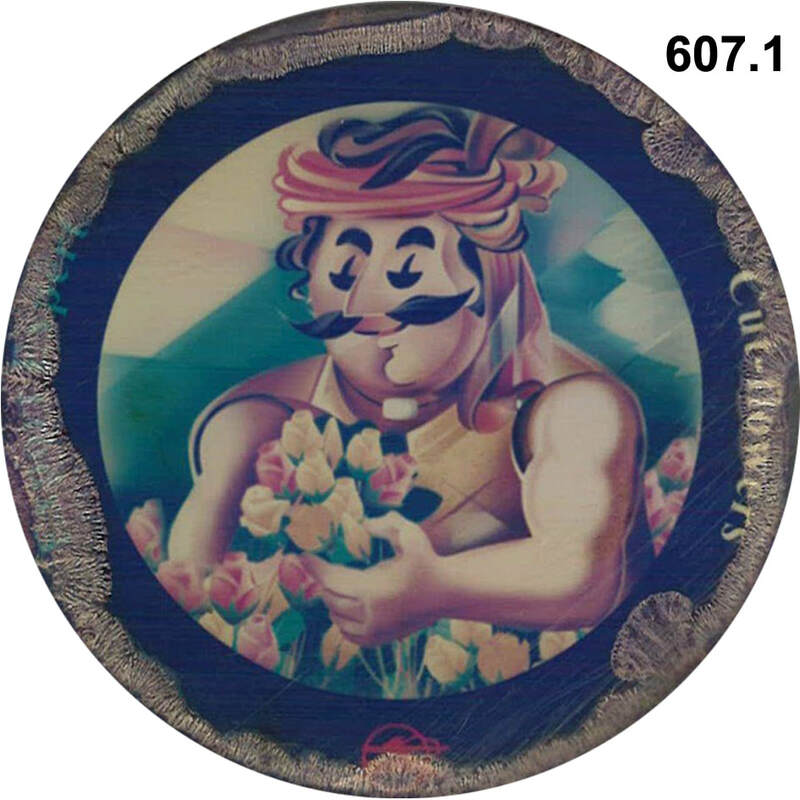 Designs of the Tehran and Brussels coasters do not correspond to any of the Types listed elsewhere. These come under this category of Type 2 coasters. The Brussels coaster has only a single colour + black. 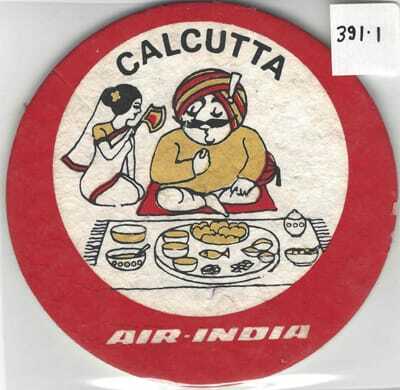 This is the only example of a single colour Air-India coaster I have seen. It also does not have the two circles, and solid border around the edge, seen in all Type1-4 coasters. The other unusual design is the Tehran coaster. This is two colour + black, but lacks the two circles and solid outside border. Instead, our Maharajah is framed in a thick square frame in the center and outside the frame, we have Tehran on a pair of opposing sides, and Air-India on the other pair. The Tehran coaster generally has the word Tehran in Blue, but an example in Green is also seen. Why did Air-India deviate from it’s set design for just these two destinations. Why do I fit these into the series of Types 1-5 as Type 2. The answer to both lies in the dates when services to both these destinations were started, and what new services came to be added, before and after these two. Air-India first added Tehran as a halt on it’s Bombay-London Boeing 707 schedule on 1 April 1967, and Brussels on 5 April 1967. Both these destinations were added by Air-India within a week of each other. The last new destination added by Air-India before this was Nadi (Nandi) in Fiji on 5 August 1964 almost three years ago. Nadi (Nandi) as a destination was added in the Type 1.2 series. Destinations added next after Tehran and Brussels issue were Mauritius on 15 August 1967 and Kuala Lumpur on 18 August 1967. 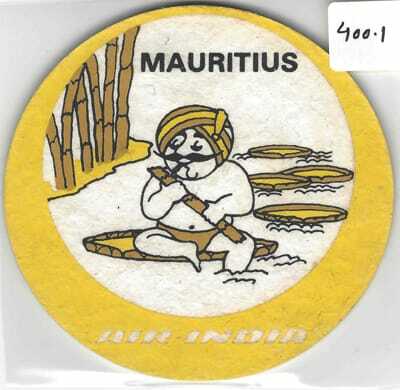 As you read on, you will find that from the launch of the Mauritius service onwards until Abu Dhabi in Oct 1970, coasters were designed with a common theme, and I will call these Type 3. Hence, I conclude that give a gap of almost 3 years between the last Type 1 and the Type 2, design standards were compromised, and these two non-standard designs were introduced. Colour variation in Type 2 coasters. The Type 2 Tehran coaster comes in two different colour combinations. On the left is the more common Blue + Red Colour Combination, and on the right is the less often seen Green + Red variety. 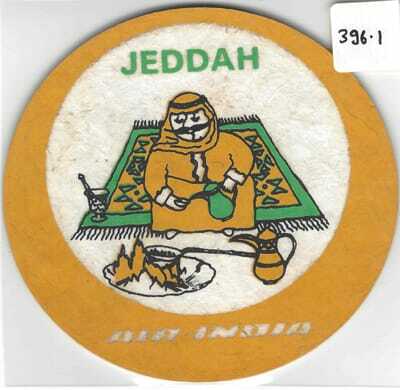 The Type 1.2 Bahrein coaster has two characters, in local greeting, and the city name is below the cartoon. The Type 3 Dubai coaster has our Maharajah alone with his camel, and the city name is now moved above the cartoon. Similar in dimension to Type 1, these round shaped coasters are made of paper pulp and have an outer diameter of 108 mm. They have a solid coloured border about 8 mm thick, and there is no background colour inside the inner circle which is about 92 mm in diameter. Printed inside upper part of the circle is the name of a destination, usually a city, but in some cases, the name of a country. 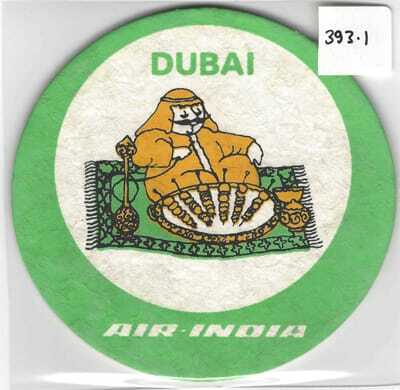 Also printed in the bottom arc of the inner circle is Air-India. Cartoon: Inside this inner circle is the drawing of the Maharajah in local attire of the destination mentioned, and most often he is alone, or with an animal. Type 3 coasters have the name of the destination printed in an arc in the upper portion of the inner circle. This is a new layout element, and until now, all Type 1 always had the destination printed in the lower portion of the inner circle. All cities covered in this Type are new destinations added in the 1970s and later. Hence, it may be fair to conclude that Type 1.2, Type 2 and Type 3 co-existed. Type 1.2 was used for existing and early destinations after change of name of the Airline in 1962, and Type 3 was used for the newer ones added after the 1970s. The curious case of the Nadi coaster. There is only one destination, Nadi (Nandi) where we find a Type 1.2 and a Type 3 coasters with a different design, but for a destination served prior to 1967. Otherwise, all Type 3 destinations are services newly started after August 1967. 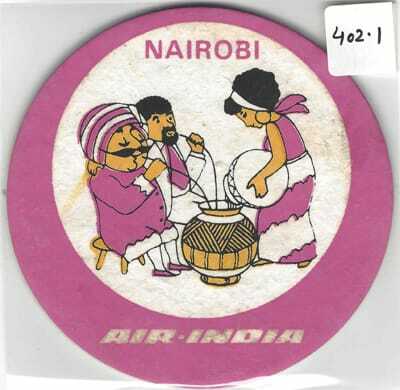 It is quite obvious that the cartoon of the Lebanese lady in Type 1.2 Beirut coaster was copied for the original Nadi (Nandi) coaster in Type 1.2. It is also quite obvious the artists in Air-India art department had no clue as to how different a lady in Fijian dress looked from a lady in Lebanese costume. Realisation seemed to have dawned on them much later, and they replaced the cartoon in the Type 3 series with our beloved Maharajah dressed like a Fijian traffic cop! What is also interesting is that this is the only Type 3 coaster with the name of the destination appearing below the cartoon. So, the design was changed, and the lovely Lebanese lady managed to retain her identity, and no longer had to pretend to be Fijian. We then have two spellings on the Type 3 coaster, Nandi and Nadi. Given that the older spelling, Nandi also appeared in the Type 1.2 coaster, we can assume that the Type 3 Nandi coaster came first, and was later corrected to Nadi. The other city name repeated, but with a new design is Zurich. On the left above, we see the Type 1.1 traditional design coaster, and on the right is the new Type 3 design. It appears that Air-India discontinued the Zurich service and then restarted it with a gap of some years,. It is understandable that there was a change in design when the service was restarted. In Type 3 again, we have one example of a change in colour scheme which is shown below. Abu Dhabi: The Blue + Green combination was changed to Pink + Green. The interesting question is, whether it was by design or by accident? 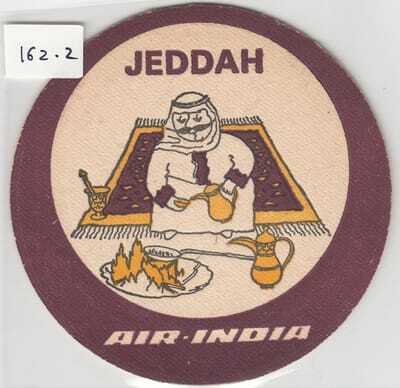 Somewhere in the 1980s, Air-India decided to completely change the design of the coasters. They got rid of the local greetings theme, and decided that the Maharajah would need more that love and fresh air to survive. A completely new design was created. Round shaped, they have two eccentric circles in their design. The outer circle is filled with a solid colour, and there is no background colour inside the inner circle. The name of a destination, usually a city, but in some cases, the name of a country is printed inside the circle. Also placed in the bottom arc of the outer circle is Air-India. Above: Two examples of the Type 4 coaster design. Eccentric circles and Food & Drink theme. On the top left is the Type 4.1 Singapore Coaster made of pulp and of the usual 108 mm diameter, and on the top right is the Type 4.2 Paris coaster with a similar design, layout, & colour scheme, but made of plastic, and with an 88 mm diameter. Cartoon: Inside this inner circle is a drawing of the Maharajah in local attire of the destination mentioned. Here we have our Maharajah connected with food and drink in some local way. In some he is enjoying all by himself, and in others he is being served by a charming hostess. In others yet, he is a vendor, providing local delights. These coasters are can be grouped in two varieties on account of some differences between them. Type 4.1: These are made of paper pulp, and also have a 108 mm diameter, similar to Type 1 & 2. The maximum gap between the circles is 17 mm, and the closest they come to, is 6 mm of each other. Type 4.1 was the most prolific design type, and about 40 destinations are known. Type 4.2: These are made of plastic, and are about 89 mm diameter. The maximum gap between the circles is 16 mm, and the closest they come to, is 5 mm of each other. The were gifted in sets of 6 with a black plastic holder, and packed in a thin card box. Only 6 destinations are known for Type 4.2. The Type 4.1 has the largest number of coasters by destination, 40 in all. Also, for the first time we notice the same cartoon design used for more than one destination. I guess the airline was growing faster that the artists ability to churn out new designs and they had to use the same cartoon for multiple locations. Let's look at what they did when they ran out of imagination. Abu Dhabi, Aden and Doha, all shared the same cartoon. I guess the artist thought all one could get there were camels and dates. Here we have Addis Ababa and Nairobi where apparently the same hookah is smoked. A good kebab is all our Maharajah wants, never mind where he is in the GCC. The same cartoon is used for Bahrain, Dubai and Kuwait. So Baghdad and Tehran have at least something in common. They do extend the same lavish hospitality to our Maharajah. Not sure how politically correct this would be in present times. Life is restful in equal measure in Dahran and Muscat. Even the date palms and the hammock are the same. ​Osaka and Tokyo take the same gentle care of our Maharajah. 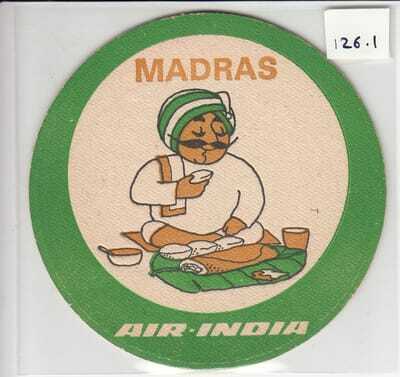 This is a new find, and I came across this for the first time in December 2016, after collecting Air-India coasters for over 2 years. 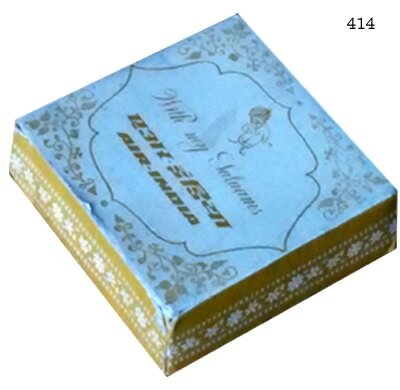 A square box made of card paper has a round window on the top so that the contents are visible. It contains 16 Type 4.1 design coasters. What makes this very interesting, is that two new destinations are introduced which did not appear in Air-India coasters so far. They are Dacca and Lusaka. This helps us date the coasters to sometime after June 1980. 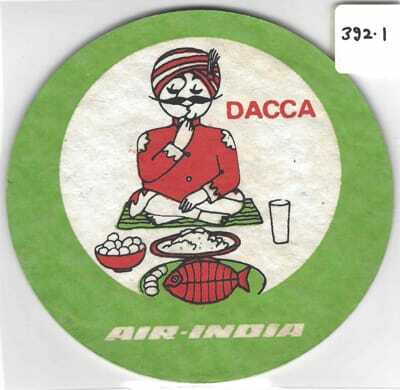 I say this because, the Air-India Dacca service was launched on 4 February 1972 with on the Dacca-Delhi-Bombay-London route. Likewise, the Bombay-Lusaka service was launched on 2 June 1980. The other very interesting aspect of these coasters is that while 14 destinations are repeated, from the earlier releases, every one of them has some variation in the colour scheme or application. I have posted images of all 16 coasters in this release below on the left, and corresponding images of the first release on the right. Left: Release 2 with a yellow and brown colour printing. Left: Release 2 with a red and brown colour printing. Left: Release 2 with a green and ochre colour printing. Left: Release 2 with a light blue and red colour printing. Left: Release 2 with a pink and golden colour printing. Left: Release 2 with a yellow and green colour printing. Left: Release 2 with a purple and yellow colour printing. 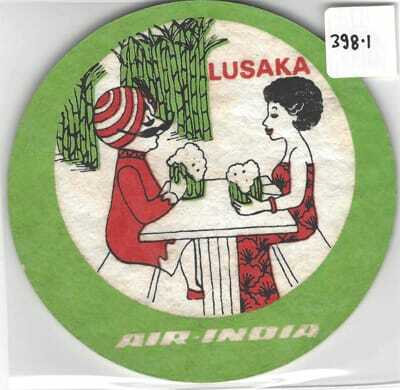 Lusaka was connected to Bombay by air with the Air-India service starting on 2 June 1980. Here we see a Type 4.1, release 2 coaster with our Maharajah enjoying a frothy beer with a charming friend dressed in the traditional costume. Left: Release 2 with a green and golden colour printing. Left: Release 2 with an ochre and green colour printing. Left: Release 2 with a pink and light brown colour printing. Left: Release 2 with a darker red and brown colour printing. Left: Release 2 with a light purple and yellow colour printing. Indian cities finally appear on our coasters. Until now, there was only one design, India, which started in Type 1.1 and continued over the years. Finally in Type 4.1 Bombay, Calcutta, Delhi and Madras make their debut. Above: The Type 1.2 India coaster. Below: The Type 4.1 coaster design for Bombay, Calcutta, Delhi and Madras. The Type 4.2 coaster gift set. 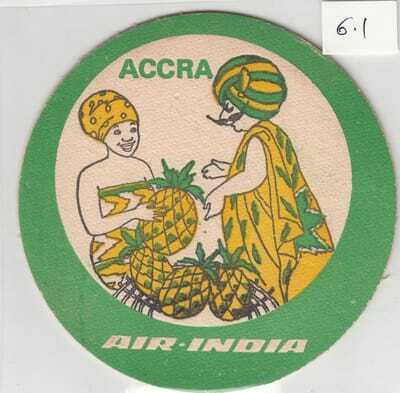 Coasters made of plastic and with a diameter of 88 mm, but with the same design as Type 4.1 were issued in gift packs of six. There is no example of a change in colour scheme within Type 4.1 and 4.2. The same basic two colour + black combination continued. About 88 mm square, these coasters have rounded edges, and are made of paper pulp. 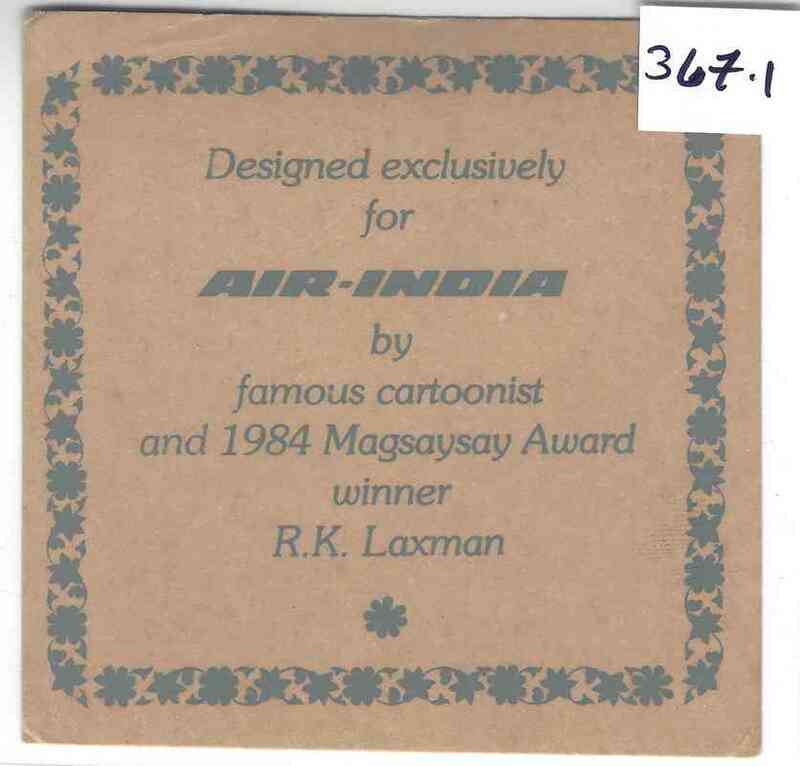 These coasters were designed by noted cartoonist R. K. Laxman and have his signature printed on each of them. The cartoons are drawn in Laxman’s trademark style, and generally feature the Maharajah at some notable landmark at the destination mentioned or partaking one of his favourite activities. The artist has preserved the characteristic humor and cheekiness, which is what the Maharajah is all about. There are over two dozen known Type 5 coasters, and let's look the images. The cartoon design used in both Montreal and Toronto is the same. Notice the difference in use of grey in the horses. Montreal appears to be all grey, and Toronto is more spotted grey. 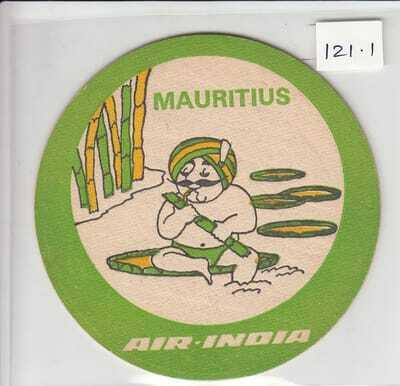 I recently came across this coaster after almost 2 years of collecting Air-India Coasters. So, I guess, while it is of recent vintage, it is not so common. 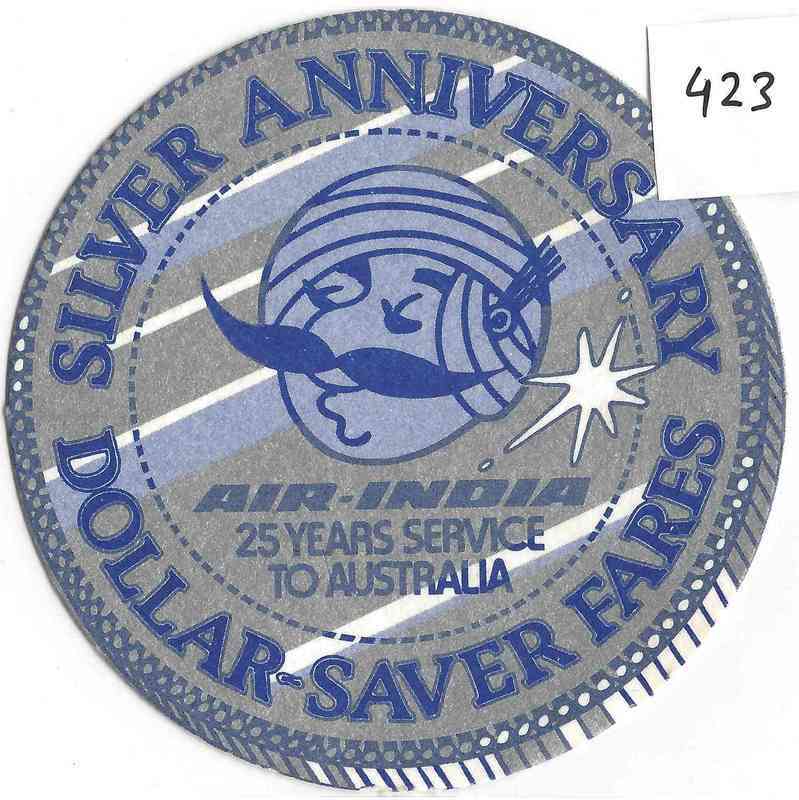 Silver paper coaster issued to celebrate 25 years of the Australia service. This service was launched in 1956, and that would date this to 1981. ​Seen by me for the first time in February 2019. Made out of two-layered plastic, the bottom layer with the image printed on it, and then protected by a clear upper layer. Seems to have been manufactured in the 1960s, and probably as a gift set, and not for in-flight service. 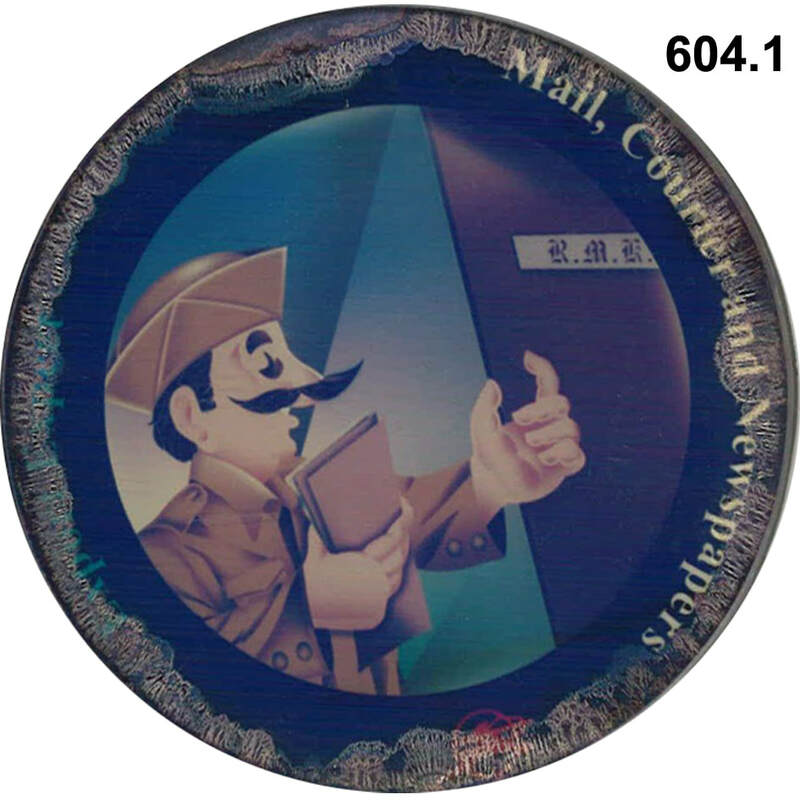 Going by the design, it may have been used as a promotion for the Air-India Cargo service. Because the set is used, some condensation seems to have crept in along the edges and resulted in deterioration. This is a new set of six coasters in a gift box. They are printed on one side only. This set has perhaps been issued in 2016 only. 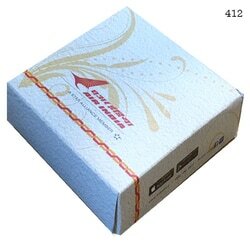 The gift box mentions Air-India as a member of Star Alliance, and invites you to download the Air-India app from the Google Play Store and Apple iTunes store. This gives a clue to the vintage of these coasters. 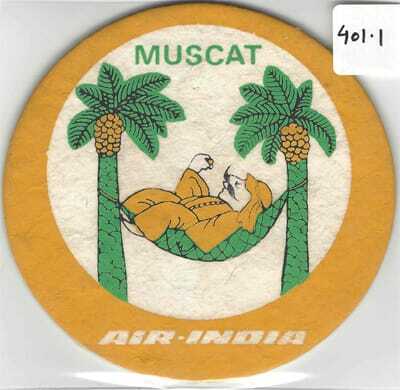 The designs are also interesting, as for the first time, the airline has not brought in international destinations, and instead focused on the richness and diversity of Indian classical and folk dance and costumes on 5 out of the set of 6 coasters. There is one of course with our Maharajah on his royal elephant, out for a leisurely ride. These coasters started getting visible late in 2016, and so I would imagine there are very recent. The Maharajah is now in traditional attire of various parts of the country, and in all examples (except Rajasthan) he is engaged in folk dance and music. All examples I have seen come packed in a gift box with the same six designs, so it seems they were brought in as a gift item, and not for in-flight use. 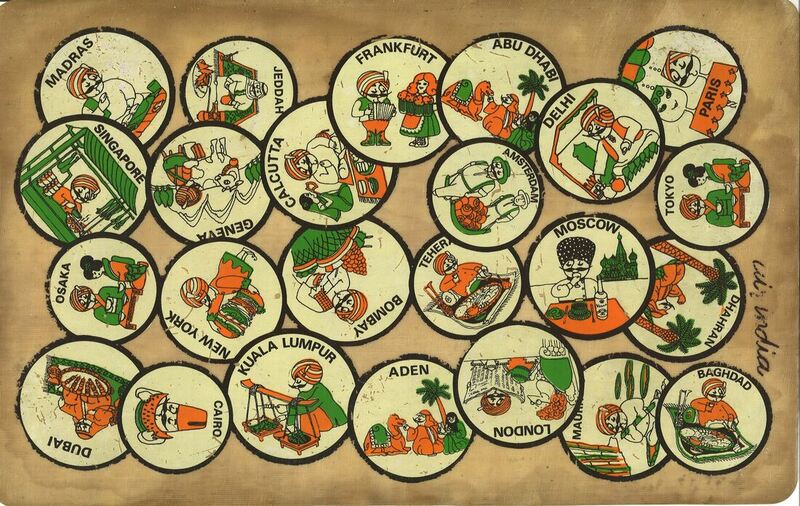 Issued at the same time as the set of 6 folk dance design coasters, this set of 6 has the globe-trotting Maharajah dressed in local attire visiting his favourite cities across the world. He has exchanged his royal robes for local attire, and is shown near the famous sites of the cities he visits. This 2016 release also has the Star Alliance logo and the Google Playstore and Apple iTunes labels encouraging customers to download the Air-India app.